Just don't roll around them covered in double-sided tape, kids! Keita Takahashi has talked about his desire to build playgrounds before, most notably in an Edge interview back in 2007, but this is the first time he's actually confirmed that he's going ahead with the plan. The news emerged from Game City tweets and also suggest Takahashi's playground will be something for both adults and children to enjoy. Yay! "The iconoclastic and much-loved game designer is spending a month in Nottingham where he will consult school children, local communities and the NCC Landscape Architect to discuss and develop ideas for the playground," reads the GameCity release. Councillor Dave Trimble, Portfolio Holder for meLeisure, Culture & Customers at Nottingham City Council said, "We're delighted to have Takahashi-san on board and very much looking forward to working with him on this unique collaboration." After considering several sites NCC has selected Woodthorpe Grange Park for the Takahashi-created playground. The site's natural rolling hills may add to the design and enable some interesting and playful landscapes. 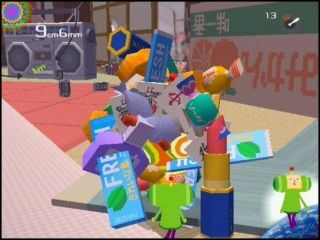 Talking about his ideas for playground design back in 2007, Takahasi-san said back then: "I'm beginning to get a bit bored making just games. I wanted something in a different area, but quite similar. "Being able to move physically, to exercise, I thought that would be a good idea to start with... At the moment, I just want to make a park where a child will feel like taking off his shoes and start to run," he said. "I feel that anything one does is enjoyable, has an aspect of play. But the way we live at the moment, play is actually a separate category in our lives which we need to materialise. "My personal opinion is that every normal daily routine should be fun, but at the moment that doesn't seem to be the case. The idea I have is to break that dividing line, integrate both areas."